Shanrahan cemetery which is situated beside the river Duag, close to the village of Clogheen, Co. Tipperary boasts quite a few historical connections. I have passed it many times myself and was often brought, as child to see the grave of Father Nicholas Sheehy , whose opposition to the Penal Laws of 18th Century Ireland saw him standing trial three times and finally resulting in him being hung, drawn and quartered. This martyred priest, however, is not the only famous link to this area. 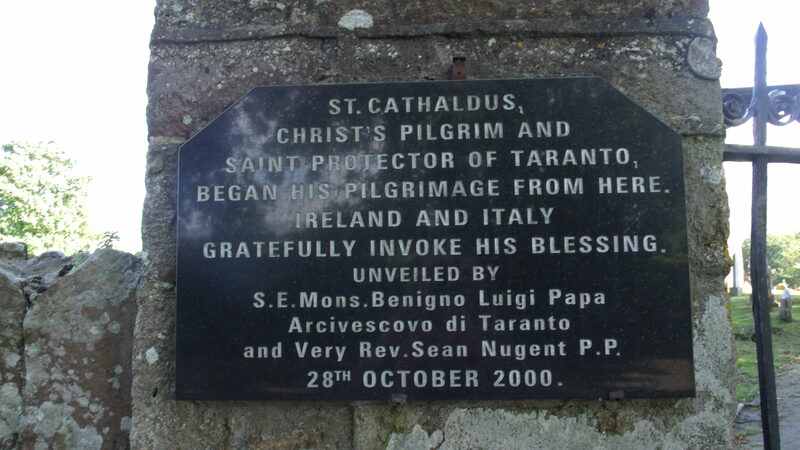 In the 7th century, Saint Cathaldus (Cathal) was born in Capagh, outside Dungarvan, County Waterford to a well-known and affluent family. Having studied and taught at the monastic school of Lismore, he was selected to be Ard Easpog (chief bishop) of the area around Slieve Cua, near Dungarvan. Following this Cathaldus then built a settlement at Rachau or Raghan, later known as Shanrahan. It is from this place that this Irish saint set out on pilgrimage for the Holy Land. Usually it is the journey outward and the sacred sites which are important to a saint’s story but in the case of Cathaldus, it his journey home which proves to be the most interesting. He was shipwrecked off the coast of Southern Italy and was rescued by the inhabitants of Taranto. 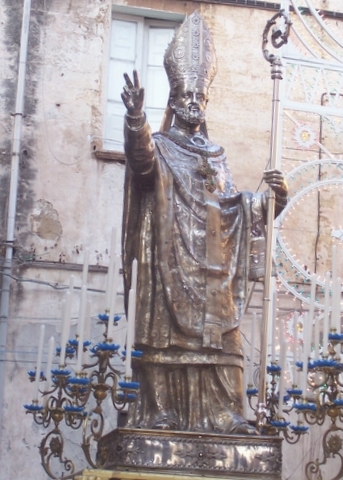 He became Bishop of Taranto and stayed in Italy until his death. His feast day in Ireland is the 8th March which marks his death while in Southern Italy, to this day, there is a three day festival celebrating this Irish saint from 8th to 10th May. 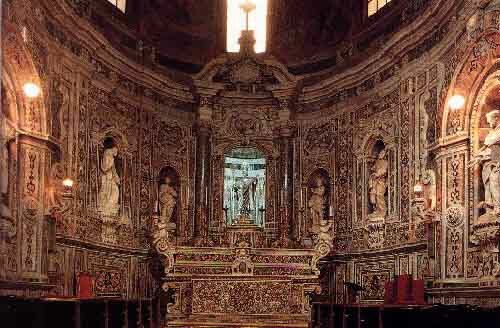 His popularity in Italy is not only present in these celebrations but also in the numerous churches which bear his name including the cathedral in Taranto. He was entombed in his cathedral in Taranto and his remains were moved about several times. In 1071 the saint’s tomb was opened where a cross inscribed with “Cathaldus Rachua” was found, maybe demonstrating that this globe-trotting Irish saint never forgot his settlement beside the River Duag in County Tipperary. 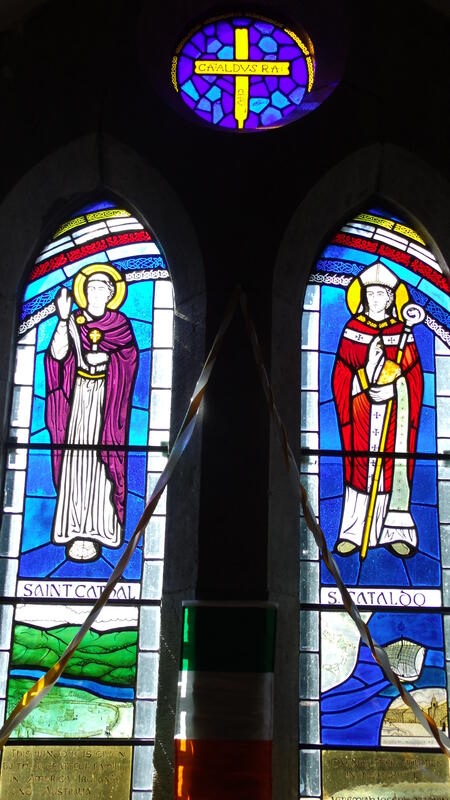 The memory of Saint Cathaldus still leaves in in this peaceful part of South of Tipperary where a stained glass window commemorates this pilgrim’s journey and influence in the local parish church of Clogheen.